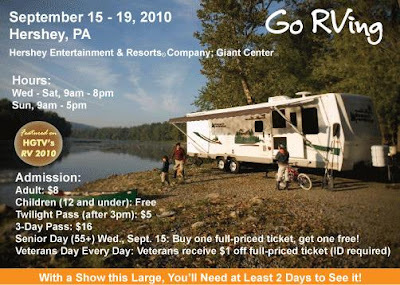 Camp Hill, PA -- RV season [is] in full swing and the Pennsylvania RV and Camping Show, America’s Largest RV Show, is preparing for another record-breaking show in Hershey, PA. The PA RV & Camping Show is the first show in the nation with 2011 products and has the largest display of Park Trailers in the country. There’s no better place for companies to promote their latest products, talk to their current customers and network with new contacts. The Show is also unique because it incorporates both trade and retail days creating a successful hybrid show that benefits the RV industry and consumers alike. The deposit deadline to participate in the Show Drawing was April 8th and the drawing [was] held May 4th at the Hershey Lodge and Convention Center. At press time, 523,586 square feet ha[d] been sold, which exceeds the amount of show space sold in 2009 by 16.6%. For more information on how reserve your space at America’s Largest RV Show or to register for the event, visit www.largestRVshow.com or call 888 303 2887. Editor's note: You may have trouble finding nearby accommodations at this late date, since you aren't allowed to stay overnight in the show RV's. I'd imagine that local campgrounds are full; ditto any close motels/hotels. Still, it's a major show well worth attending if you can. And if you go, consider stopping back here with a report-back! Class-A motorhome in New York, from Hawaii ~ Any ideas for what might be the best overland route? 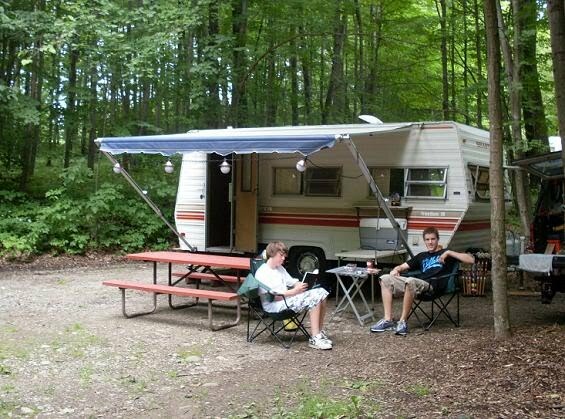 When we're camping, we often take a walking tour of the campground, marveling at the distances some campers have traveled to join us here. 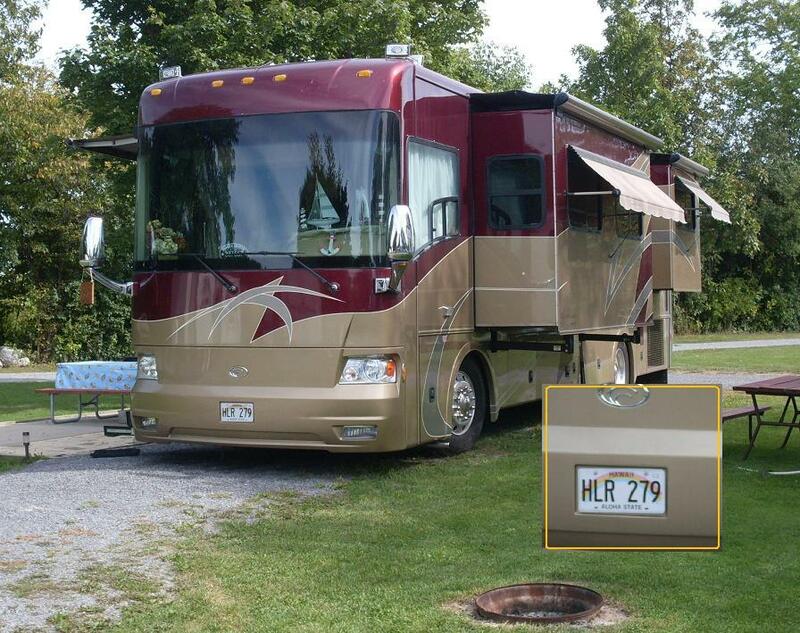 On our most recent stay we saw motorhomes with plates from Montana and Texas. During our stroll this afternoon, we spotted a beautiful cruiser whose plate made us look twice. I think this one will hold the distance record for the foreseeable future. see inset ~ no further explanation required! We haven't yet taken any long-distance trips with our trailer, especially since gas went up; but we will. What's the farthest you've ever traveled while camping? 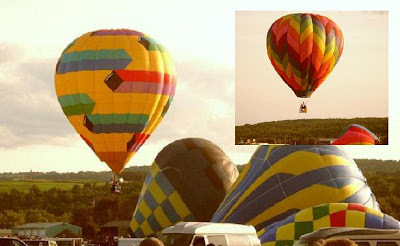 We got up at dawn on Labor Day to race down to Dansville's Festival of Balloons (NYSFB at Dansville). We were running a bit behind, but made good time to the airfield, only to find that the festival had ended on Sunday. The joke was on us, and I won't have new pictures from the 2010 launch. In fact, the weather was so fickle during the weekend, I'm not sure if they launched at all. As a consolation prize, here are the photos of fancy balloons I promised last year but never delivered. 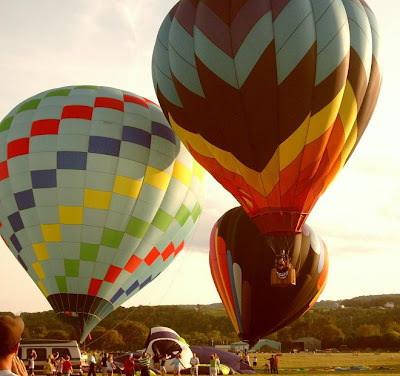 I'm sure some or all of these beautiful hot air balloons was in attendance this year, too. Don't forget to close the barn door! This one's got speckled wings for extra lift aloft. A blatant plug for Bricker's "famous" french fries. Cool, huh? I'm sure this bucktoothed guy has a name. And ideas? Wake me up! Seems like I've seen this one in my nightmares. 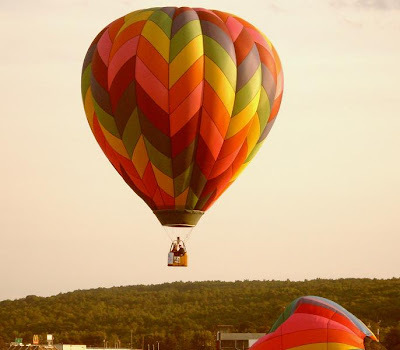 We're disappointed that we missed the Balloon Fest this year -- it's become a tradition of ours to stay at Skybrook Campground overlooking the airfield in the valley. 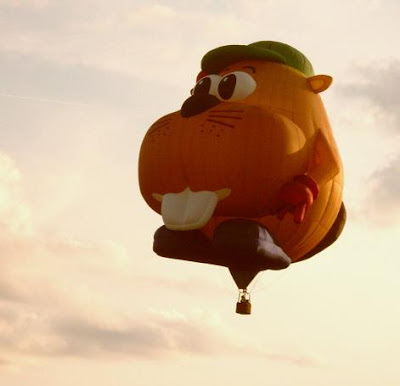 In fact, last year we watched the balloonists sail directly over our campsite shorty after we arrived. This year the weekend's weather just wasn't great for camping, so we went hiking instead. I'll have pictures from that adventure later this week. 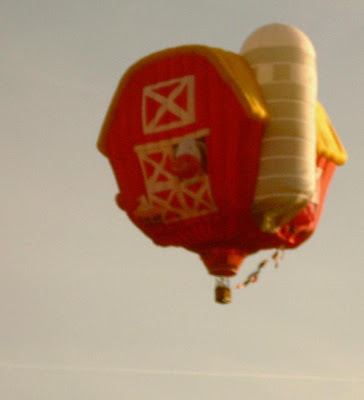 That's the final batch of hot air balloon pics from 2009. 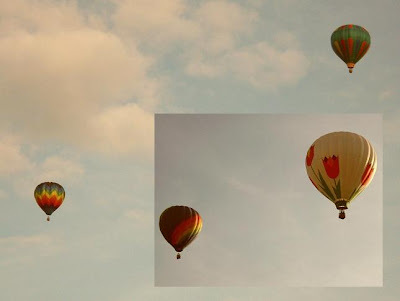 You can see the first group of balloon photos here, and the second round of hot air balloons in the air here. 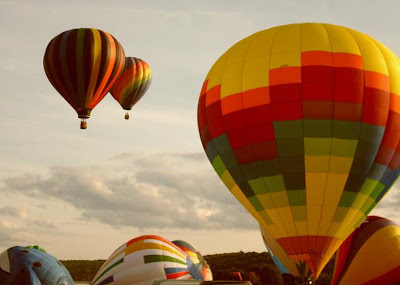 If you have pictures from 2010's Festival of Balloons and want to share, please contact me via Comments or by using the link at the top of this page. We had five idyllic days of camping, sunny and 90. At night the big pond reflected flickers of campfires and the starlit sky, accompanied by a full chorus of insects. Hard to even imagine a more perfect week at the campground. Because of work schedules, most of the time it was just Nick and me. Here's how it went. We started out an hour or so behind, and had to stop for groceries on the way. Heat waves shimmered off the parking lot. 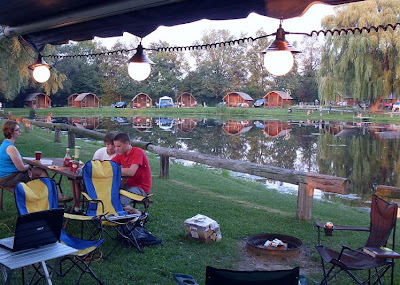 When we arrived at KOA Canandaigua, our reserved site had been changed (previous tenant still on it). We'd been moved to #86, where we'd stayed before, but decided to check out #110 (farther back) for a change. After a quick once-over, Nick and I both agreed that #86 was better. We had trouble deciding how to situate the camper, but took some friendly advice and got it just right. Next to our site was a brand new Scotty camper -- that was cool! Under the giant willow with a breeze from the west, we set up camp. Austin and Lin showed up later, and we four had a lazy evening of hot dogs and burgers. Too hot to go swimming! One relentless fly woke me up early. We took care of that issue later on, using an old-fashioned sticky strip. Both boys went golfing that afternoon, and Lin had a meeting, so I was on my own for a while. Spent some time on emails, and more time with a good book. When the boys returned at dark, we all played a couple of games online. Nobody felt like swimming. We stayed up 'til midnight. No flies in the morning; that was much better. My dad showed up with breakfast, and later returned to have dinner with us. In between, Nick and I took a long hike and had a round of mini-golf match-play. Nick won, up-7. We considered trying the new motorized pond boats, but held off. After dinner, we three plus Grampa played a lively round of KanJam. Grampa (my dad) is 80 years old, and he's got mad skills! Later we three boys hung out together in the shade. We never did get to the pool, and the night was so gorgeous we hated to go to bed indoors. We got our own breakfast. Nick and I had a nice lazy morning together. "Wanna go swimming?" I asked him; he shrugged and moved deeper into the shade. We did manage another stroll through the woods, exploring. Our friends stopped by in their blue Mustang convertible, just to say hello. They came back later on, when Austin was back from work. Midday, I managed to defeat Nick in a re-match, 3-up. All day long the big rigs pulled in, Class-A's and giant 5th-wheelers and a long pull-trailer or two. The gang was streaming in for Labor Day Weekend. We had fun watching. Dinner was lunch-meat and watermelon. Past dark, one star rose brilliantly over the pond in the southeastern sky. None of us could decide on its name. My cell phone woke me up. Dad brought breakfast again. Still 90 degrees, but we didn't have time for a leisurely swim. In fact, I forgot that check-out was 11:30, and a staff member had to remind me to get a move on -- the people who had our campsite next had arrived an hour earlier than they should have. Luckily, I'd spent half the morning puttering around, packing up for departure. As we hooked up, the hitch nearly fell off its stand. That could have been ugly; but we managed to avoid disaster. On the way out of the campground, it felt like our camper's brakes weren't releasing. We pulled over just down the road, and found the brake safety-cable had nearly pulled free. Problem solved, and home we went. ... The previous week, filled with work, had been cloudy and cooler but sometimes sunny, too. Saturday -- the first day of the Big Final Weekend -- dawned damp, dreary, windy, and 30 degrees cooler. We timed it all just right, and managed to reserve four Perfect Camping Nights for actual camping. It was wonderful. 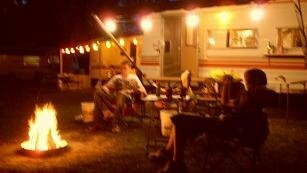 The camping season's nearly done. We didn't camp at Skybrook this year as planned for the weekend -- didn't like the forecast a bit, though it turned out okay, just chilly. We may get one or two camping weekends in during September, depending. No matter how it goes, Nick and I sure had a perfect week. 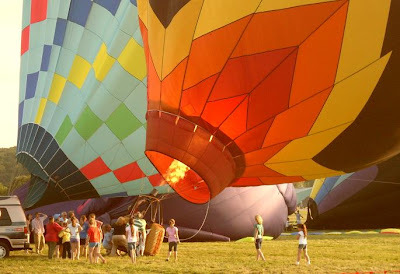 DANSVILLE, NY (2009) First one, then another, then three more and a dozen -- hot air balloons cleared the launch field and battled for suddenly-crowded air space at the Dansville Airport. 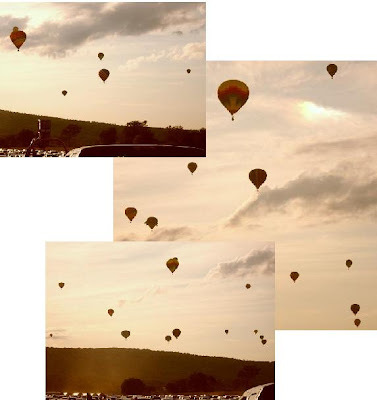 This montage of photographs details the lift-off of nearly 50 dazzling aircraft at Dansville's Festival of Balloons (NYSFB at Dansville). Final pictures, featuring the "special" entrants, will be published later this week. It takes a big burn to get airborne. This balloonist blistered three large holes in his craft. They bump, they push and shove. First one to get clear wins! This colorful herringbone-patterned balloon went straight up. Looks like some sort of financial chart. "Things are looking up!" Black diamonds are good, right? Background: herringbone gets some air. 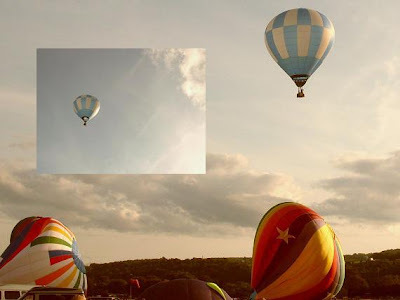 An elegant balloon showing only blue and white finds the clouds, higher and higher. These two look like they're headed for a collision. It's just an illusion. 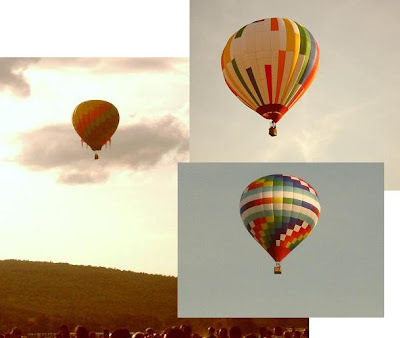 Three of the more exotic color patterns gain altitude and solitude. One monstrous eye looks on as a crazy-quilt of colors soars overhead. 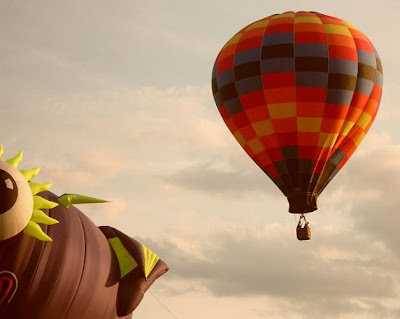 Two pairs of balloonists head heavenward. They soon joined the crowd, nearly out of sight. 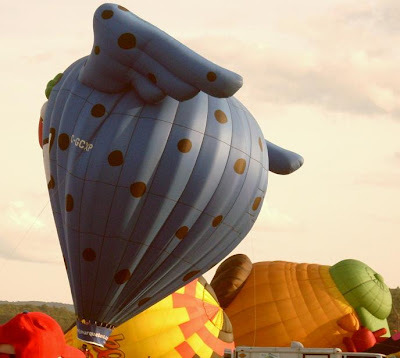 Top to bottom: more and more balloons sail to the northwest of Dansville, and toward the horizon. 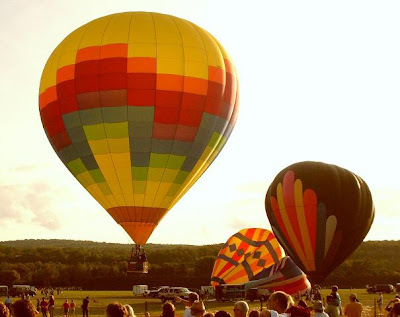 In all, more than 40 hot air balloons filled the sky on that spectacular Sunday evening at Dansville. 2009 was a beautiful Labor Day Weekend for ballooning. See the earlier balloon pics here. Final batch of exotic-design balloon pics soon.